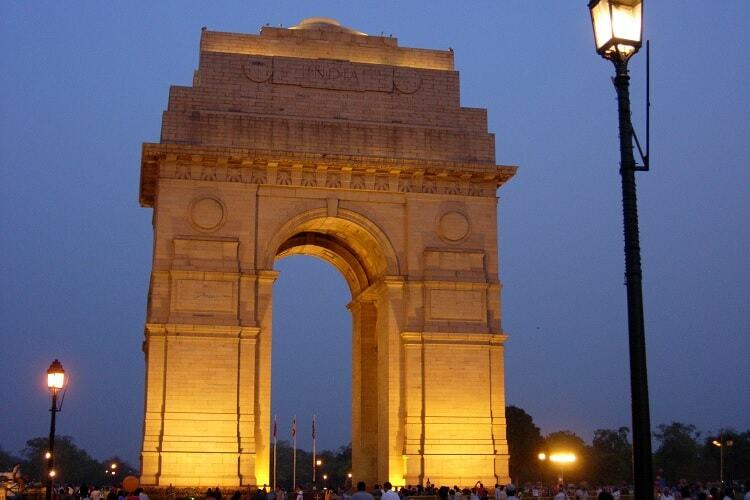 List of tourist places in Delhi with location, timing, entry fees & historical facts. From Santram Holidays. Have a look at the images, location, timings, entry fees of all the must see tourist sites & monuments in New Delhi, India. 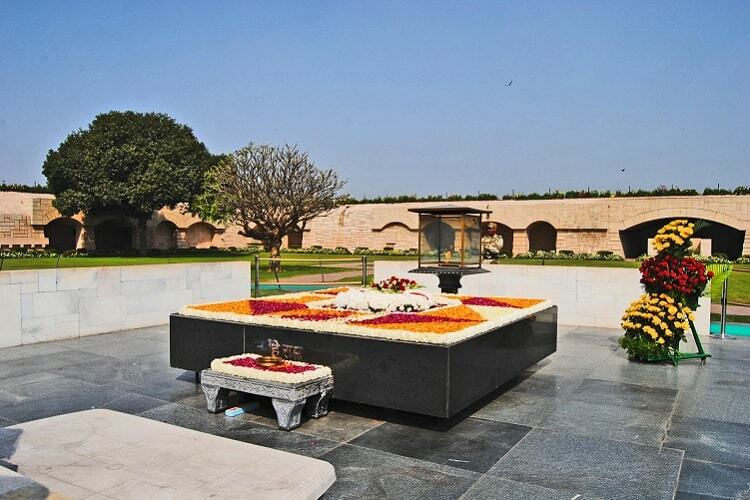 Also known as, Raj Ghat and associated memorials, is a memorial dedicated to Mahatma Gandhi. Opening time: 6 am to 6 pm in winter and open half an hour early in summer. 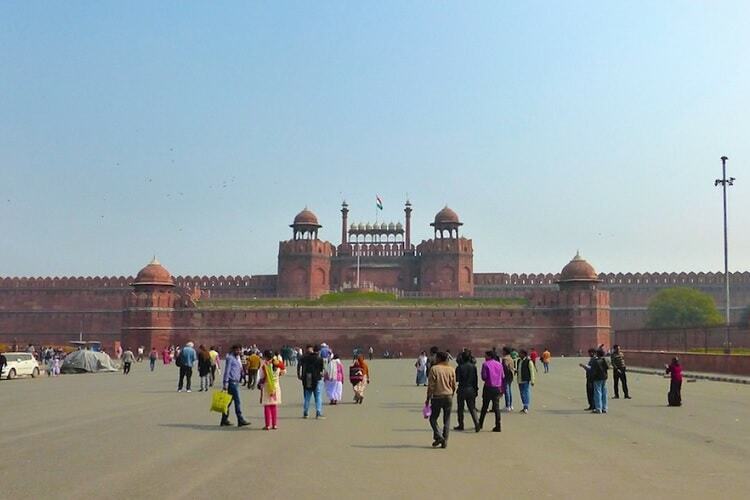 Delhi’s Red Fort was built by Mughal Emperor Shah Jahan in 1639 AD. At that time, the city of Delhi was built around this massive fort and was known as Shahjahanabad. Opening time: 9:30 am to 4:30 pm (sunrise to sunset) and monday closed. Entry Ticket: Rs 35 for Indians and Rs 500 for foreigners. Nearby attractions: All sites of Chandni Chowk area like Jama Mazjid, Jain Lal Temple, Gurudwara Sis Ganj & Rajghat is in 1-2 km radius of Red Fort, Delhi. 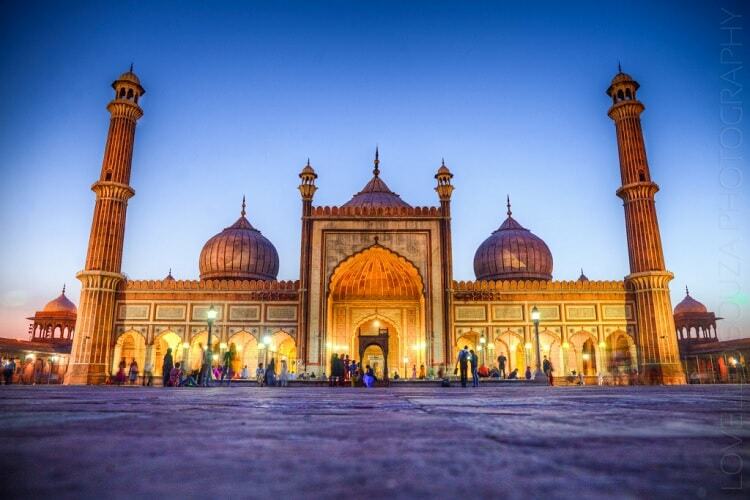 Jama Masjid of Delhi was also built under the regime of Mughal Emperor Shah Jahan, in 1656 AD. Delhi’s Jama Masjid is the largest Islamic mosque in India. Entry Ticket: Entry here is free, but if you are carrying a camera, then you need to pay Rs 200 for that, but not for mobile cameras. Nearby attractions: Red Fort, Jain Lal Temple, Gurudwara Sis Ganj, Raj Ghat (whole Chandni Chowk area) is 1-2 km radius of Jama Masjid. 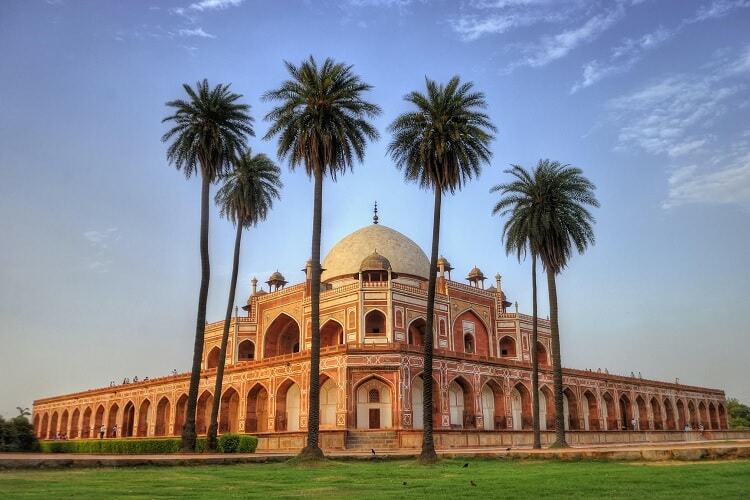 Humayun Tomb is the Maqbara (Tomb) of second Mughal King Humayun. This tomb was built in 1565 AD by Humayun wife Bega Bagum. Opening time: 6 am to 6 pm every day. Entry Ticket: Rs 30 for Indians and Rs 500 for foreigners. Nearby attractions: Delhi Zoo, Purana Quila and Nizamuddin Dargah and Millennium Park are in 1-2 km radius of Humayun Tomb. 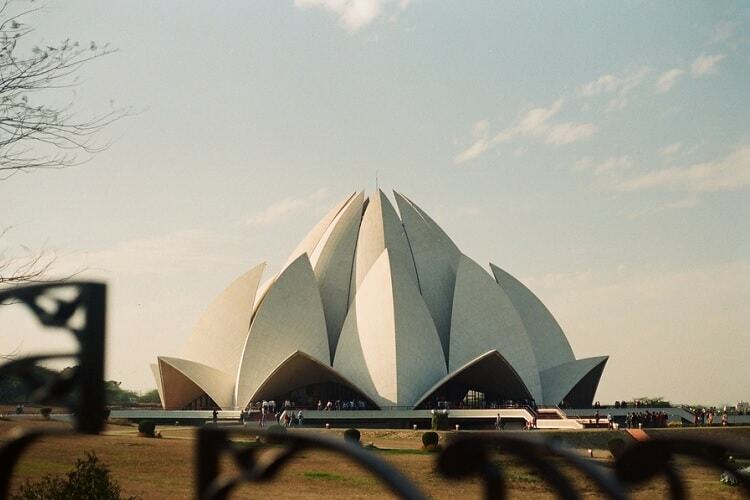 Lotus Temple is lotus flower shape building, which is a Bahá’í House of Worship, built in 1986. Here people from all faith, caste and color are welcome and thus Lotus temple has become a prominent tourist attraction in Delhi. Opening time: 9 am to 5:30 pm and monday closed. Entry Ticket: Entry is free and permission is requited to bring cameras inside. 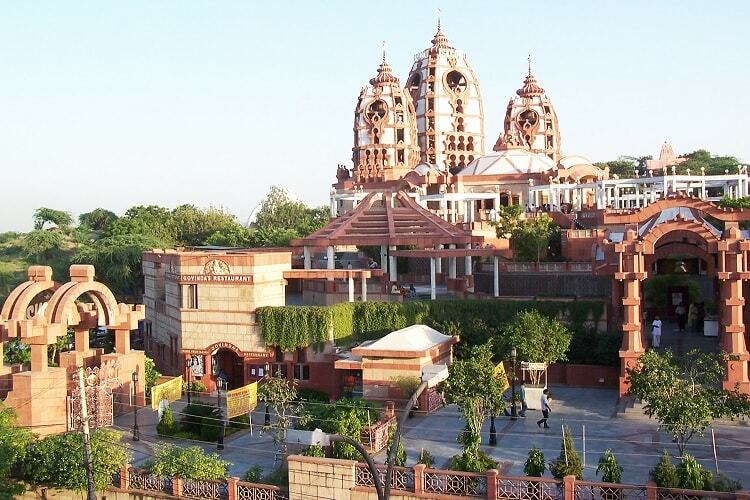 Nearby attractions: Iskcon Temple and Kalkaji Temple are in 1-2 km radius of Lotus Temple. 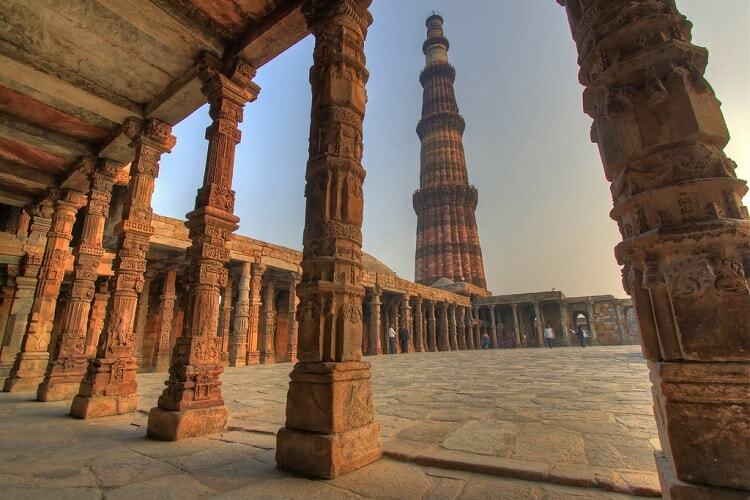 Qutub Minar is a UNESCO workd heritage site in Mehrauli (west Delhi), and not too far from Delhi Airport. Qutub Minar was built in 1220 AD by Qutb Ud-Din-Aibak, who was the founder of Delhi Sultanate, which lasted till early 16th century. Opening time: 9 am to 4:30 pm every day (sunrise to sunset). Nearby attractions: Mehrauli Archaeological Park and The Garden of Five Senses are in 1-3 km radius of Qutub Minar. India Gate and Rashtrapati Bhavan are two popular tourist attraction in Delhi, and are on same long street, known as Rajpath. Rashtrapati Bhavan is the residence of the elected President of India, and India Gate is a war memorial for the 82,000 soldiers of the Indian Army, who gave their lives in World War 1. Opening time: 6 am till midnight & Rashtrapati Bhavan tour is only overview. Entry Ticket: No entry fees here. Nearby attractions: Birla Temple, Teen Murti Bhawan and Gurudwara Bangla Sahib are in 1-3 km radius from Rajpath. 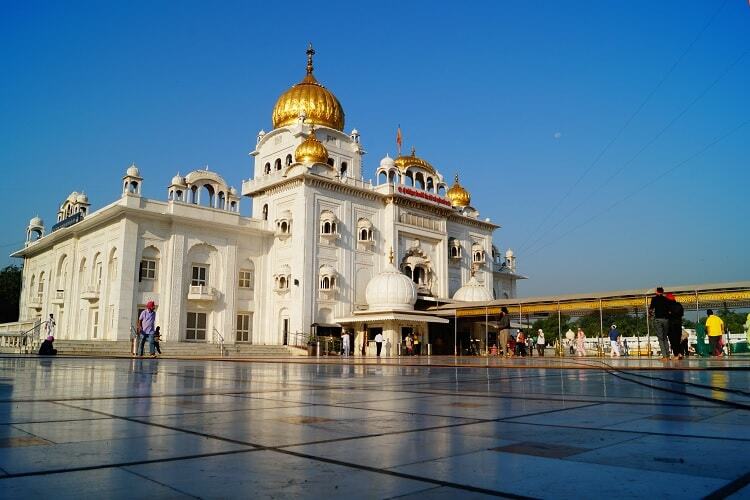 Gurudwara Bangla Sahib is one of 10 historical Sikh Temples in Delhi, located near famous Connaught Place market. Guru Har Krishan, who is the 8th Guru of Sikhism, lived here and cured many people suffering from smallpox & cholera epidemic by the holy water on the Gurudwara complex. Today Gurudwara Bangla Sahib is one of the most visited Sikh shrine in Delhi, visited by people from all faith, and by many travellers to see this beautiful temple and pond. Opening time: 24/7, but the best time to visit is from 5 am to 10 pm. Nearby attractions: Connaught Place market, Pracheen Hanuman Mandir, Sacred Heart Cathedral, Jantar Mantar, Gurudwara Shri Rakab Ganj Sahib and Rajpath are in 1-2 km radius of Gurudwara Bangla Sahib. 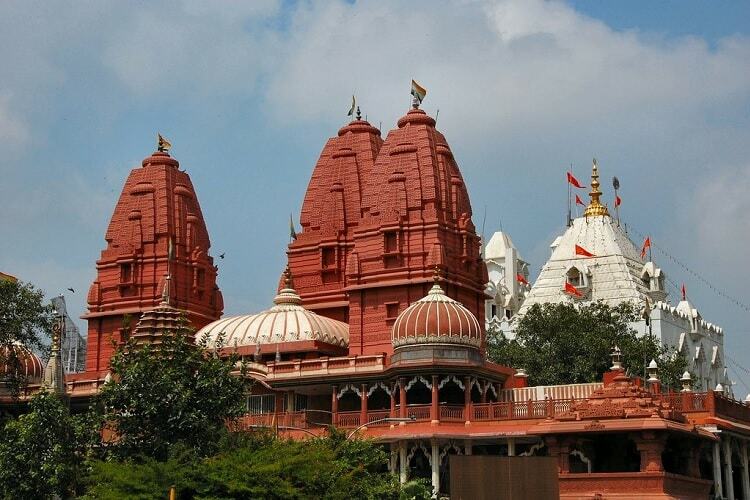 Laxminarayan Temple, also known as Birla Temple of Delhi, is a Hindu temple dedicated to Lord Vishnu. The temple is in Gole Market area which is very close to Cannought Place & Rajpath. This temple was build by Baldeo Das Birla in 1933 AD and was opened in 1939 by Mahatma Gandhi. Mahatma Gandhi kept a condition that he would only come in the temple inauguration, if it’s doors will be open to people from all caste. Entry Ticket: No entry fees here, but photography inside isn’t allowed. Shri Digambar Jain Lal Mandir, also known as Jain Lal Temple, is one of the oldest Jain Temple shrine in Delhi, built in 1658 AD. The temple is also a famous avian veterinary hospital. The temple is in Chandni Chowk area, just opposite to Red Fort. Nearby attractions: All attractions of Chandni Chowk and Rajghat are within 1 km radius of Jain Lal Temple. 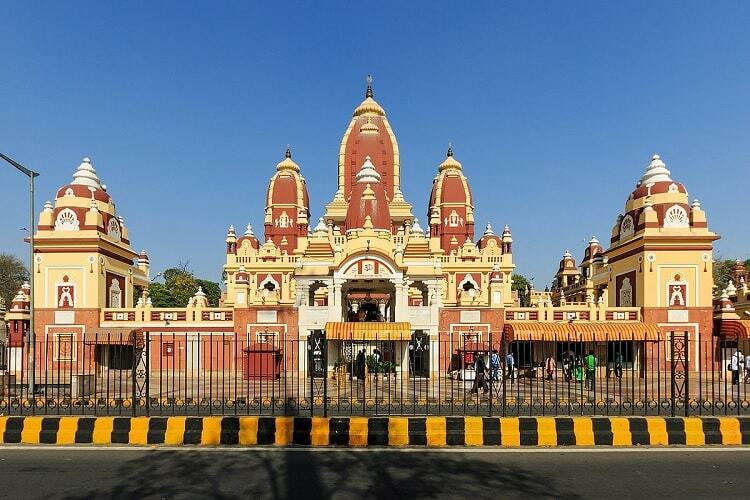 The Iskcon Temple Delhi is one of the oldest Iskcon Temples in India, opened in 1998 by ex-prime minister Atal Bihari Vajpayee. In the temple complex, you will find a museum of Vedic Culture, Bhagvadgita animatronics Robot show, and a Art Gallery on Ramayana. The location of the temple is East of Kailash, which is in South Delhi. Nearby attractions: Lotus Temple is 15 minute ride from Iskcon Temple. Lodi or Lodhi Gardens is a 90 acre, well maintained garden with small ponds, and tombs of Sikandar Lodi and Mohammed Shah’s, from Delhi Sultanate era. These gardens were built in 1444 AD, later they were also developed by British and now they are one of the best picnic spot in New Delhi. 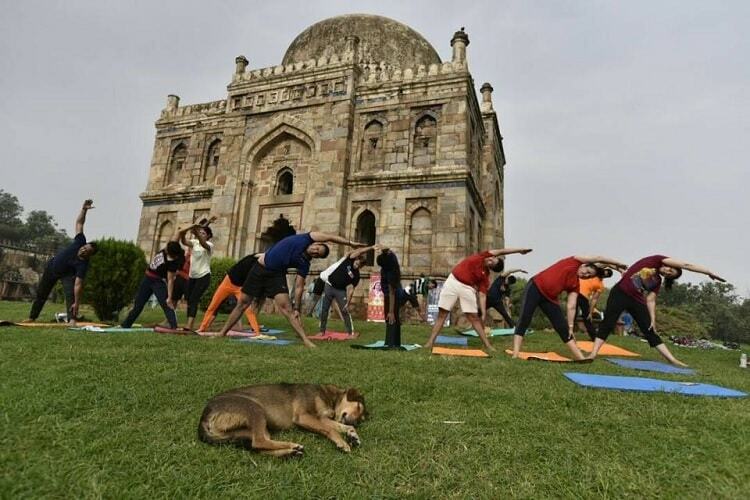 Nearby attractions: Lotus Temple, Khan Market & Humayun tomb are half an hour drive from Lodi Gardens. Today, Teen Murti Bhavan is a memorial of Jawaharlal Nehru legacy, which contains his work, books. etc. 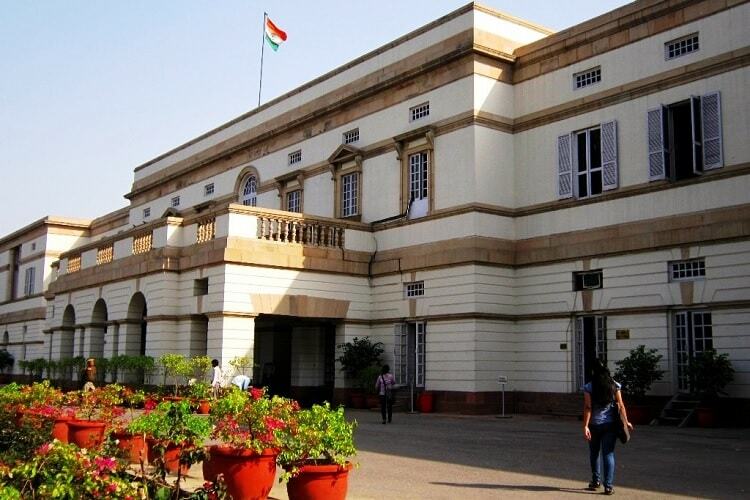 The location of Teen Murti Bhavan is Teen Murti Marg, close to Rashtrapati Bhawan. Entry Ticket: Will update soon. Nearby attractions: Nehru Planetarium (just next), Indira Gandhi Memorial Museum, Gandhi Smriti, Lodhi Gardens and Rajpath are in 250 meter to 4 km radius of Teen Murti Bhavan. Santram Holidays two days Delhi sightseeing tour. Santram Holidays Delhi Agra 2 days tour. Santram Holidays Golden triangle tour package for 4 and 5 days.